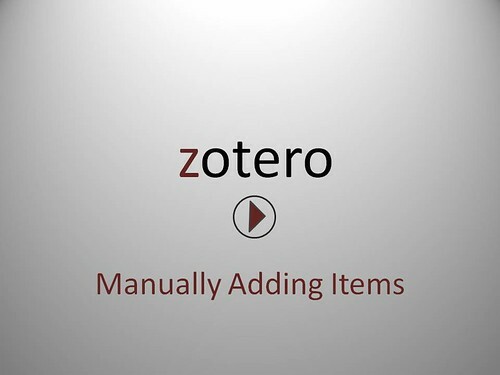 manually add items to your Zotero library when the Zotero icons are not available on the URL bar. Either watch the screencast or view the step-by-step screenshots. For a text-based version of the directions, click here. Click full screen to view the video. 1. 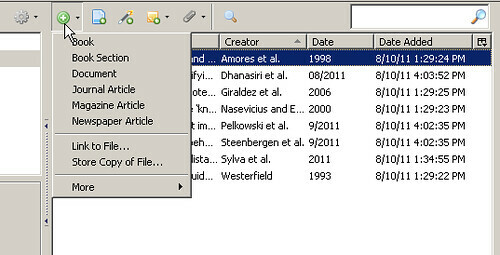 If the "add to Zotero" icons are not available on the URL address bar or if you just want to add the citation information for something that is sitting on your desk, click the green circle on the Zotero toolbar to manually add items to your Zotero library. 2. Choose what type of item it is from the drop down menu (notice the "more" option). 3. 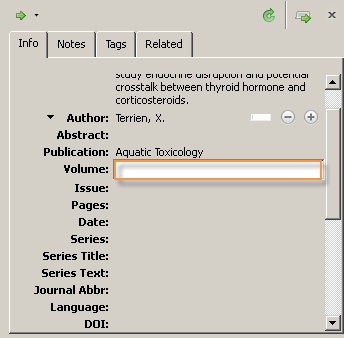 You will be given blank fields in which to enter the information about your item (in the right-hand pane). 4. Click on the fields and/or use the tab key to navigate through the fields. 5. View your completed entry in the center and right-hand panes.